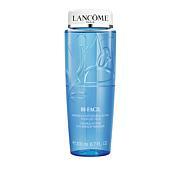 Lancôme Bi-Facil Large Eye Makeup Remover - 6.8oz. A beautiful-looking complexion starts with clean skin. 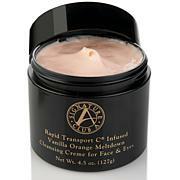 This gentle formulation instantly removes traces of makeup, leaving skin clean, balanced and absolutely beautiful. Ingredients: AQUA (WATER), PEG-6 CAPRYLIC/CAPRIC GLYCERIDES, PROPANEDIOL, PENTYLENE GLYCOL, SODIUM CHLORIDE, PHENOXYETHANOL, POLOXAMER 184, TETRASODIUM EDTA, HYDROLYZED SOY PROTEIN, CITRIC ACID, PATHENOL, PARFUM (FRAGRANCE), MALTODEXTRIN, MENTHA PIPERTA (PEPPERMINT) LEAF WATER, PROPELENE GLYCOL, TREHALOSE, BENZYL SALICYLATE, HEXYL CINNAMAL, GLYCERIN, LACTITOL, XYLITOL, SODIUM HYALURONATE, LINALOOL, PRUNUS PERSICA (PEACH) FRUIT EXTRACT, BENZYL ALCOHOL, CENTAUREA CYANUS FLOWER EXTRACT, SORBIC ACID, DEHYDROACETIC ACID. Who would think that something that looks and feels like water would so completely and gently remove all of your makeup? Well, this product does just that. No more tugging at your eyes over and over again trying to get off all of that stubborn mascara. This works quickly and is very gentle on your skin. I really love all of her products and highly recommend them. Gentle, light feminine fragrance. Must be a little patient with heavy or Extended Wear Eye Make-up Products. If you Gently Remove the top coat of Eye Make-up first, then go back and just place a little more of the Remover on Cotton Pads and Place on your Eyes and...wait for it. Eyes and surrounding tissue / skin are delicate areas to begin with. DO NOT be AGRESSIVE with removing or cleaning these areas or you will surely break down the cellular structure and develop problems such as, wrinkles the signs of early aging. This was my first purchase. I have tried many Eye / Makeup Removers over the years, and this product is right-up there with the quality and yes the pricing of most Top Shelf Product Lines. Think of Long Term use and effect on your Eyes / Skin, not just a cheaper and faster product. We know where to find those! Wonderful..but way too expensive ! The product does all it says. It removes even waterproof makeup easily and has a delightful fragrance. Because the bottle is so small (4.2 oz. ), I am only using it sparingly for eye makeup. Unfortunately, because of the price, I will not be ordering it again, unless there is a very special price offered.. I buy an oil free ,gentle product that works the same for only $10 for 8 oz. at a local Health Food store. This is a really great makeup remover but it does not warrant the price tag. I think Trish is way out of touch for charging over $30 for a makeup remover when you can buy a comparable item for less than $10 at any drug store. That is a message for HSN too. Please HSN do not forget your core customer base, the ones who helped you build your empire. Confidence is beautiful. Renowned makeup artist Trish McEvoy uses her 35 years of experience to show women how to effectively enhance their appearance and make their beauty regime effortless. Her results-oriented collection includes professional-quality makeup, tools, skincare and fragrances that are both innovative and intuitive. Remind me about Trish McEvoy upcoming shows.